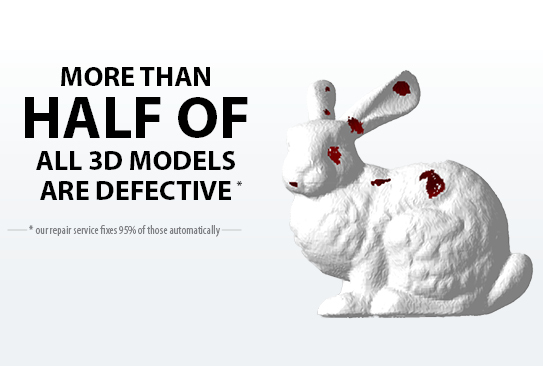 Did you know that over half of all 3D models contain flaws? Astonishing as it may seem, it’s true. Flaws, major and minor, can lead to serious frustration in the 3D printing process. They result in longer production times and higher costs, something businesses and hobby printers alike would prefer to avoid. Even the most gifted CAD specialist can have problems with a model. But there is no need for despair, use our 3D model repair service and create a flawless 3D model every time. Holes: This one should be pretty obvious. Even when you are careful, holes or unsealed points can appear in your model. The problem here is that the presence of a hole confuses the printer, which can no longer distinguish between the inside and outside of the model. Disconnected planes: A 3D model is made up of many triangles that share edges. It is not uncommon for a plane (or triangle) that is partially or completely disconnected from the others to appear in a 3D model file. Again, this isn’t good news for your 3D printer, which is confused by these detached planes. Flipped normals: Another common problem, but happily simple to fix, are flipped normals. These vectors define the orientation of a triangle’s surface in your 3D model. In essence they define what is inside and outside. Problems arise when the normals are incorrectly oriented. When this happens, it causes the printer to see inside as outside and vice versa. In every case, these errors cause misprints or flaws in the printed object. Frustrating as this is, there is a simple way to avoid these problems all together. We’d like to introduce you to our 3D model repair service. 3D printing has countless possible applications, and it makes manufacturing accessible to anyone. At trinckle, we believe that typical manufacturing errors, like those described above, shouldn’t hold people back from getting exactly the print they want. That’s why we developed our 3D model repair service. It is absolutely free to use, automatic, and fixes up to 95% of all model flaws. How does our service repair your model? It automatically detects holes and then creates one or more triangles to patch your model. Those pesky disconnected planes are automatically detected and removed. Flipped normals are automatically reoriented, making it possible for the printer to distinguish inside from out. It doesn’t get simpler than that. If you have questions about how to get started with 3D printing visit our blog or check out our FAQs. At trinckle, we strive to develop 3D printing software that enables businesses and hobbyists alike to create amazing things. Our repair service is just one part of our software suite, that is revolutionizing how people work with 3D printing. Learn more about paramate, our customization platform for 3D printed products, on our website.